The Russian acrobatic gymnasts were lucky to pick up additional three gold medals at the Acrobatic Gymnastics World Championships on the 3rd May, 2016. They headed the country's most dominant performance at the World Championships in 12 years. The final day was significant by the fact that Marina Chernova and Georgy Pataraya were congratulated with their victory in Mixed Pairs. Moreover, Zhanna Parkhomets, Yulia Nikitina and Valeriia Belkina won their first World title in Women's Group. Only in Men's Group the Chinese proved that they are insurmountable having left the Russians behind. China has definite goals at these competitions. First, they wanted to win gold medals. Second, they wanted to increase the popularity of acrobatic gymnastics within all the spectators. The Chinese Men’s Group was invincible having achieved the only World title not destined for Russia. The four gymnasts (Li Zheng, Rui Liuming, Zhang Teng and Zhou Jiahuai) lived up to the precedent set by their predecessors at the past two World Championships, finishing 1.6 over silver medalist from Israel, the largest margin of victory in any category. Belarus and China each won three medals in Putian. It was a remarkable improvement from their classifications two years ago in Paris. Belgium, a traditional Acro powerhouse, contented itself with one silver and a bronze, and will aim to build on those results as Antwerp gears up to host the next World Championships in 2018. 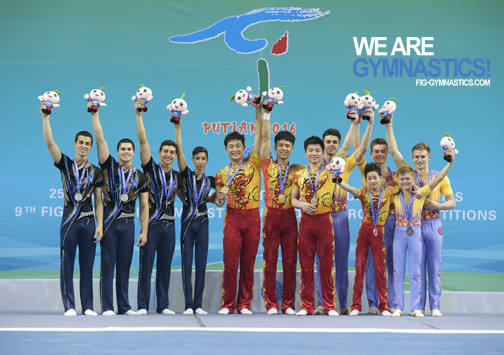 The Acrobatic Gymnastics World Championships in Putian was the only way to get qualified for the World Games in 2017. The Women’s Groups who were qualified are from Russia, Belarus, China, the Democratic People's Republic of Korea, Great Britain and Portugal. China, Great Britain, Israel, Russia, Ukraine and Australia also qualified Men's Groups, while Russia, the USA, Portugal, Belarus, Great Britain and Poland earned the right to send Mixed Pairs. < The World Cup stage 2016 in Pesaro!